It’s hard to believe a new year is approaching so quickly. Hopefully you have enjoyed your summer and are rested and excited about the upcoming year. I would like to take this opportunity to personally welcome you to the 2018-2019 school year at Jackson-Milton. For some of you this will be your very first year. For many others, you have experienced many years being part of the Blue Jay family. I look forward to continuing the excellence established in this community. As the instructional leader of the school, my focus will be on increasing student achievement. Every student is expected to achieve at the highest levels possible. To this end, our school's instructional goals for every student will continue to be : improve student achievement and performance, increase the rigor,richness and relevance of the curriculum, and heighten student success.Another goal is to build community relationships by increasing positive communication between families. This communication will be the lifeline to the positive relationship that is needed to help a school survive and prosper. 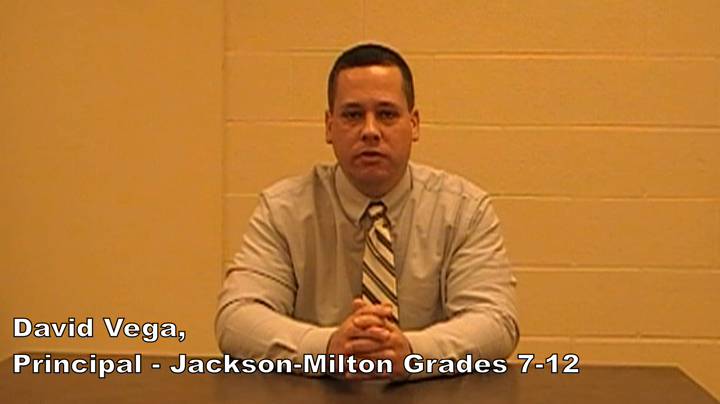 The staff at Jackson-Milton is pleased to offer your child the best in educational experiences. Our teachers,specialists and support staff are dedicated to providing students with an exceptional academic program.At Jackson-Milton we endeavor to provide a positive learning environment serving the educational,emotional and social needs of our students. I invite all of you to attend our extracurricular events and please do not hesitate to visit the building or contact us with any questions that might arise during the year. I look forward to getting to know all of you during this school year and working towards continuing to make Jackson-Milton a successful place of study for all of our students.